New Christmas MultiTracks from Meredith Andrews Now Available! 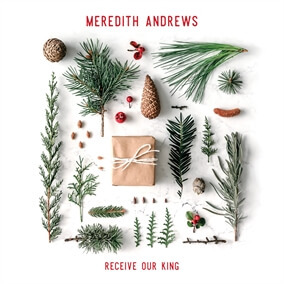 Today we are excited to announce the beginning of a new partnership with Word Worship starting with the release of multi-Dove award winner Meredith Andrews' new Christmas album, Receive Our King. This album was produced by Meredith's husband Jacob Sooter and is full of well-known traditional Christmas songs along with several new original tunes. "Every year I look forward to when it’s time to listen to Christmas music," she shares. "I have several 'go-to' albums, the ones that immediately take me back to my Christmases as a little girl as well as the ones that are just fun, meaningful, or nostalgic. When it came time to make my own Christmas album, I wanted to capture the beauty and wonder of Jesus coming to earth as a baby to rescue the world and to create a project that would deepen the listener’s experience of Christmas. I am so excited to release Receive Our King for the coming Advent season, and pray that everyone who hears these songs will be drawn in to remember, reflect, and respond to the birth of our Savior that truly was the turning point in history." Check out the the entire album today, which includes "Come Thou Long Expected Jesus," "He Has Come For Us (God Rest Ye Merry Gentlemen)," and "Away in a Manger / The Gospel Changes Everything," and pick up the resources you need as you share these songs in your Christmas services this year, including the Original Master MultiTracks, instrument parts in RehearsalMix and charts for each song, which we will be releasing over the next few days.